That is right. 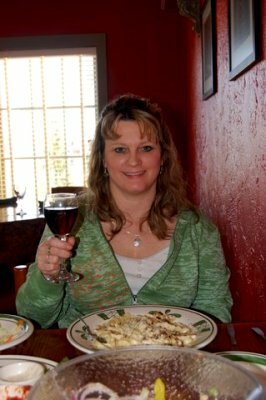 Instead of being productive, I went to Olive Garden with our daughter Heather, and enjoyed an appetizer of calamari with dipping sauces of marinara and dill, a salad, the infamous garlic breadsticks, chicken alfredo, iced water with a lemon wedge, and a single glass of the nearly $5.00, red Rosso house wine. Then I went home and took a long nap; when I woke up, I went to the Redbox booth in town and rented the totally mindless, Tyler Perry new movie, Madea Goes To Jail. Well, so much for vacuuming the house. Now I don’t usually do this. Most days I faithfully check off all the items on my to-do list. If I do something not on the list, at the end of the day I write that on the list too, and check that off (the melancholy part of my personality). I am NOT a procrastinator by nature; in fact, I hate procrastination. So what gives this week? As I’ve shared before, Cindy Rushton is my role model for true godly success in writing, speaking, wifehood, and homeschooling. So I felt really bad and lazy after watching her YouTube vlog, Bust That Plateau: Set Daily Goals. The woman is a non-stop, production machine. I finally decided that this was just what I really needed to do. Have you ever had one of those weeks? Where you did absolutely (gloriously) nothing? As long as we don’t make this a habit, I believe sometimes we need time off from our busy schedules to just do something fun (shocked gasp). We don’t need to beat ourselves up that we didn’t finish our “important” goals. Life is meant to be lived. Take some time out for fun this week. That to-do list will still be there after you get back looking at the pretty, fall leaves with your child at the park, dancing at the friend’s wedding, eating at a Japanese steakhouse with your husband, or shopping for a new, warm hoodie with your best friend. ← Eternity drama a success!